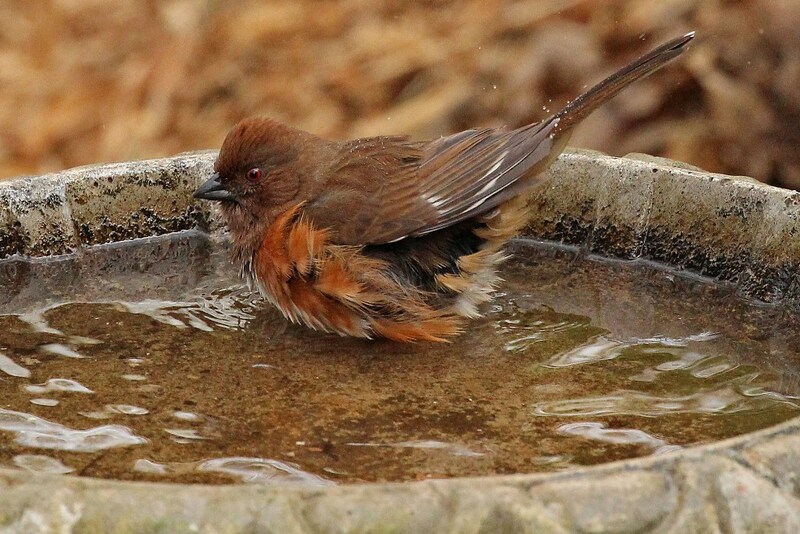 I was so glad I had my camera in hand when this beautiful female Towhee stopped in for a bath. Since they are ground feeders and rarely come up to the deck, I don’t get to take their picture as often as I do some of the other birds. …and sometimes getting photo-bombed by another bather! Doesn’t she look lovely with her ruffled feathers and her water-droplet-bedazzled tail? 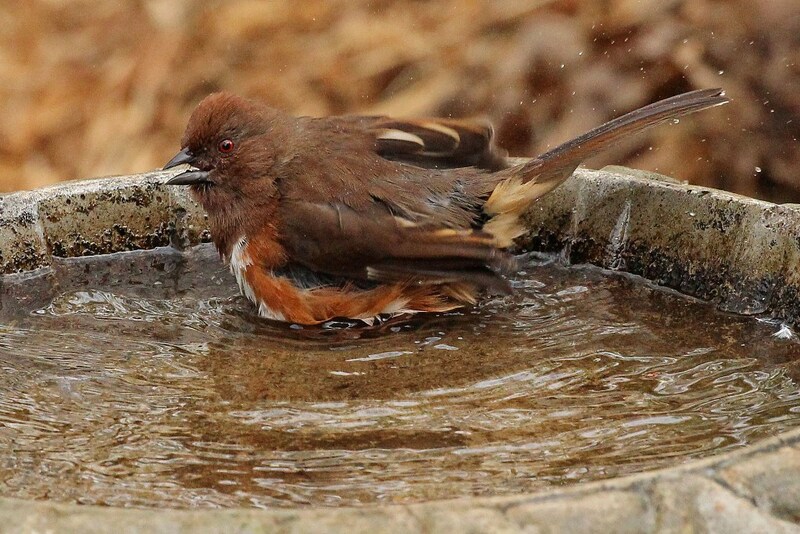 Now to convince the male to come and have some Towhee time in the birdbath! 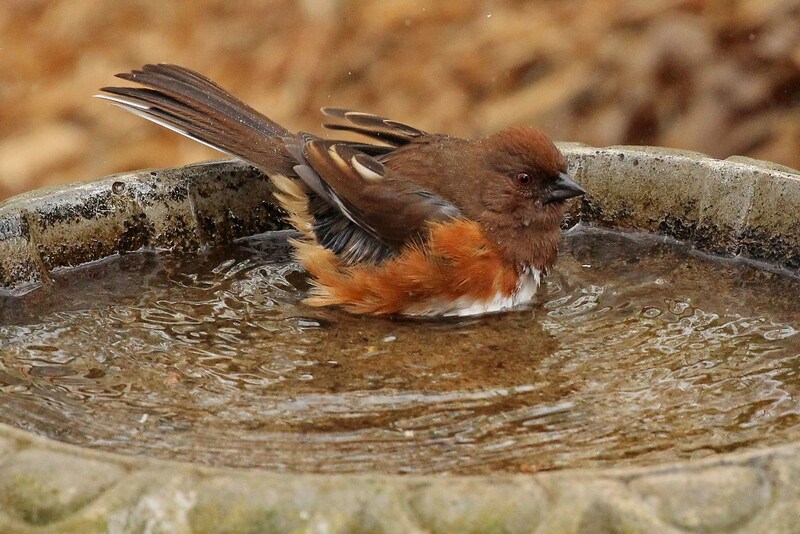 This entry was posted in Backyard Birds, Bathing Beauties and tagged bathing birds, birds, hobbies, nature, photography, towhee, wildlife, writing. Bookmark the permalink. She is a real Bathing Beauty! 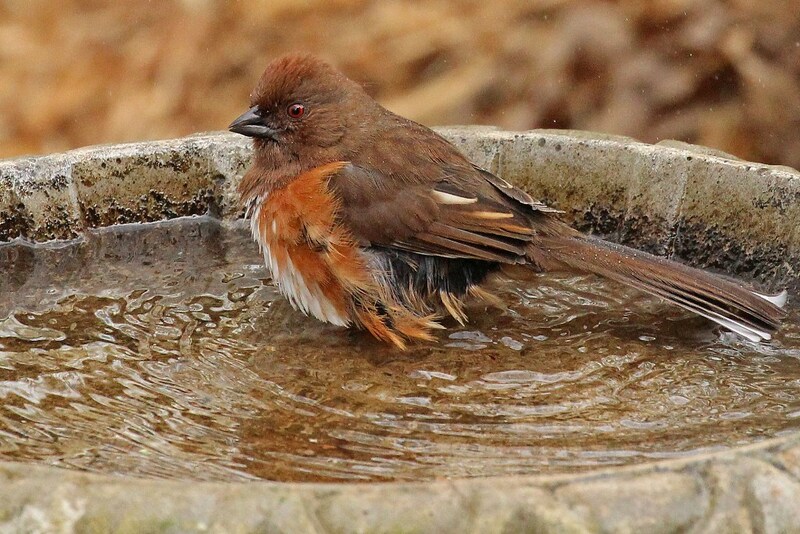 I have several towhee families in my Asheville backyard these last few years. They have moved in, stay year around & are a delight calling & calling all day long & keep busy-busy bobbing amongst the doves to find every tidbit on the ground. I love her color tones! 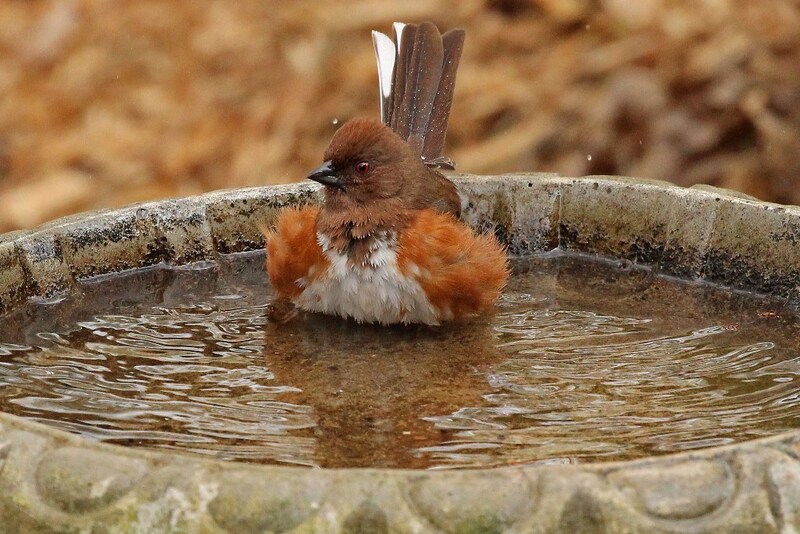 How funny would that be…to put a powder puff prop in the birdbath! I did it years ago in my backyard to take pictures – I also put a bottle of “Mr. Bubble” there as a prop. Where I go for my hair, the owner is creative and buys slate and paints it and does lettering for whatever you want done. He also does quotes. They are all around the salon. 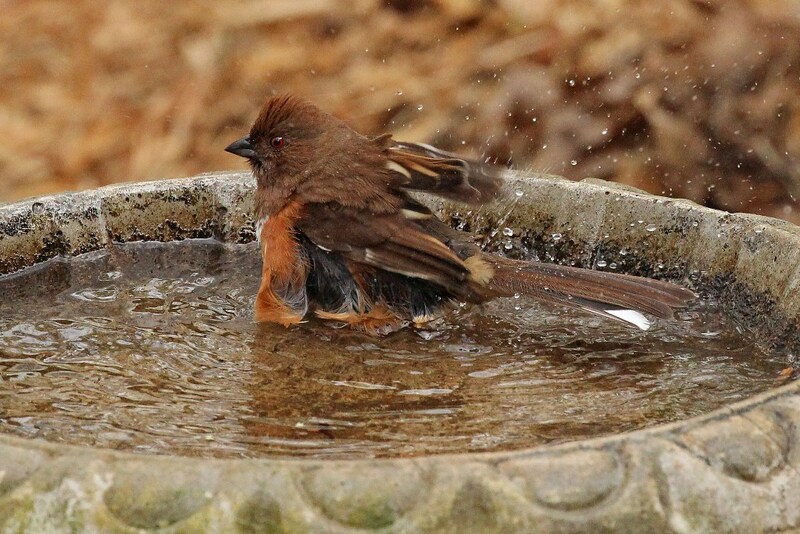 I had him do a couple for me about the birdbath. “Baths $0.05” and “Drinks for Free”. 🙂 I had some fun with it. oh what great captures! So glad you shared! LOVE! So Cute! 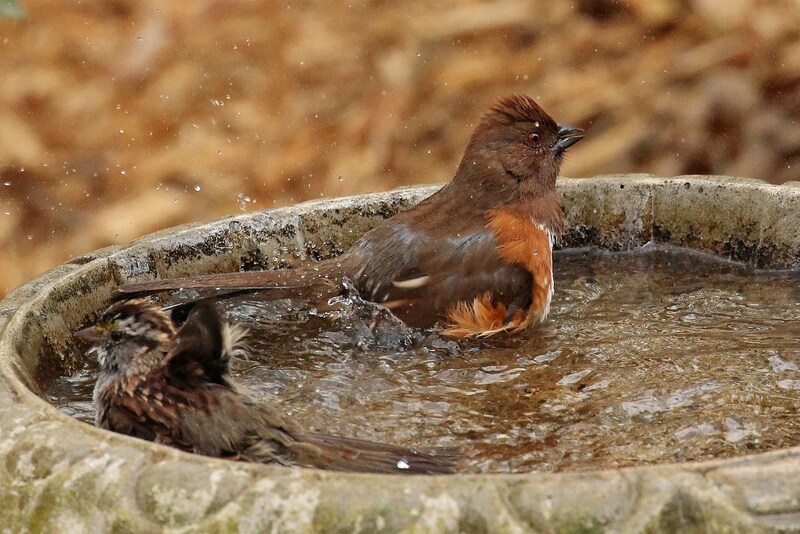 My birds only drink; No bath.